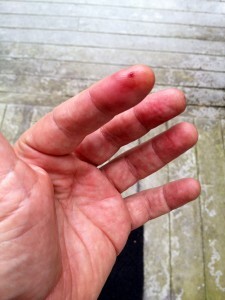 So no guitar recordings for me this week while my poor l’il finger recuperates. But I’ll try to compensate for this dog-ate-my-homework post by sharing three works in progress. If they turn out well (and they might! ), audio and video will follow. 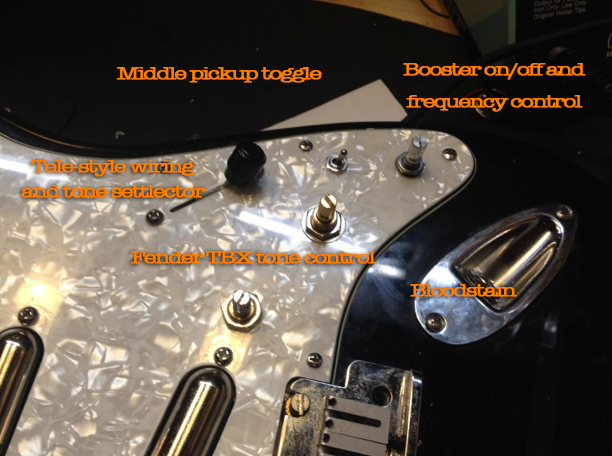 It’s my first attempt at deploying the Fender TBX tone control in a lipstick-tube guitar. 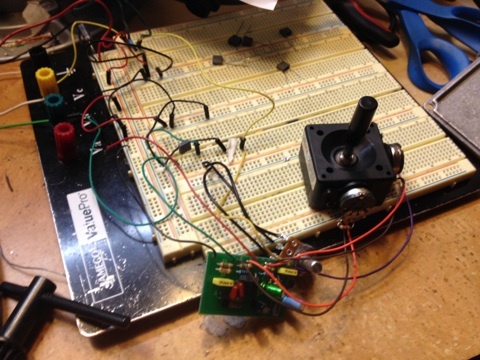 I’ve added an onboard boost/distortion, roughly based on a Rangemaster. 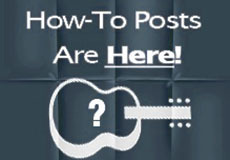 It employs a new variant on Nashville Tele wiring. Joystick fuzz: like giving a loaded gun to a monkey. 3. A Reanimated Amp. This one’s personal: I’m finally refurbishing the 1951 “TV front” Fender Deluxe amp that I received for as a bar mitzvah present in the ’70s. (I was mature enough not to express my disappointment over getting some crummy old tweed. But how I longed for that shiny post-CBS crap!) My mom procured it from the son of one of her fellow elementary school teachers, who worked at Fender in nearby Fullerton. (Sadly, I’ve forgotten his name.) I also got to pick from three early-’70s Fender guitars: a sunburst Strat, a paisley Tele, and a black Jazzmaster. I, of course, chose the Jazzmaster — at the exact moment when no one on earth gave a crap about that model. And naturally, I sold it just when new wave arrived and Jazzmasters became cool again. See? I established my pattern of buying and selling the wrong things at the wrong times while still in my teens! 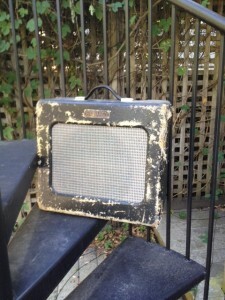 I didn’t wreck the amp by myself — the process started with the black paint job it acquired long before I entered the picture. Over the years it received a preamp mod from Paul Rivera, and later got totally ruined by an overambitious repairman who added mods I never requested, and who probably stole most of the original electronic parts. But the cab, chassis, speaker, and output transformer are original, and there’s no reason why it shouldn’t sound bitchin’ after I restore it to its original 5A3 circuit. I’m getting expert help from Tube Depot’s Rob Hull, who helped me source parts and make a grommet board to house the components. So my apologies for all talk, no audio. My boo-boo is healing, and I should be back able to, like, actually play some of this stuff soon! Remember back in the ’80s when Guitar Player was all about anything from the CBS era was crap? Just kidding. 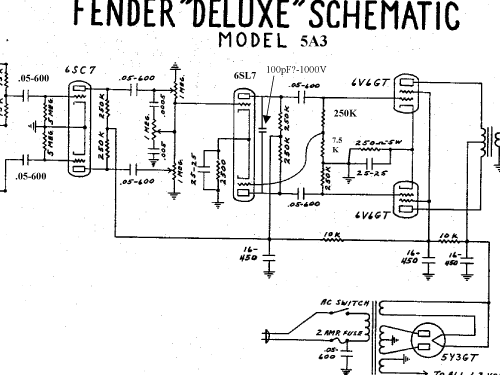 Though the amps I coveted as a kid really were crappy — like master-volume Twin Reverbs and such. But nowadays we seem to realize that Fender’s post-CBS decline was gradual, and that a lot of late-’60s/early-’70s amps are awesome. I used to play live through two Super Reverbs, one blackface and one silverface. I sold the blackface (for a laughably low amount) because the silverface really was the better sounding amp. Fortunately you can blackface a lot of the CBS stuff. The xfrmrs, pots, tubes etc. were all the same as the BF Fenders and they used to be a deal. Nowadays even stock silverfaces cost a ton tho’. I used to do a few blackface mods on the Twin Reverbs with the ultralinear xfrms (these were hated by many folk) throw in a set of 7581s (industrial quality 6L6s) and they sounded fantastic if you want a clean power amp tone and they loved FX. You did need to bias them properly and recap the power supply as well.Sadly all the NOS 7581s are gone but maybe some of the Tungsols Mike Matthews makes in Russia might fill the bill, his Tungsol KT120s , KT66s and 6550s all sound very good close to my good NOS versions. The ugly part of the CBS amps was caused by the Electrical engineers brought in by CBS who relied only on test equipment and forgetting that ears are what counts. For example many guitar amps will have parasitic oscillation when connected to non-inductive dummy loads and oscilloscopes so the EEs added suppressor caps to the output tube sockets from plate to ground resulting a dull sound basically killing that gorgeous Fender shimmer and sparkle on the high end of the audio spectrum. If you connect the amp to a speaker the the inductance of the voice coil suppresses all the parasitic oscillation naturally. You can simulate the reactance of the speaker on the test bench by adding a .01uf cap in series with an 8 ohm 1/2 watt resistor across the non-inductive dummy load (many hifi amps used this as part of the output amps all the way back to the 50’s). So you can blame the silverface mess on the EEs that never paid attention to the real world application of the amps. If you can’t tell I have a bad attitude towards EEs which is why I always picked the cherries in my electronic studies and never stayed around long enough to get a degree. You might get a better deal on one with the ultra-linear xfrmrs they are rated at 135 watts vs 85 of the non-ultra-linear types. You can always disconnect the screen grid windings to go to a conventional fender output amp (make sure to insulate the unused leads). It is also important to have screen grid resistors in series with the screen grids whether you use the ultra-linear windings or not as the screen rigs are the weak link in most tubes and limiting screen current increases tube life dramatically. These amps do have higher B+ so make sure you have tubes capable of the B+ available.The filter cap setup was a different as well. These amps also had JBL ceramic 12″ spkrs instead with heavy frames and magnets. Most of these had the pull switch on the master volume for a boost or distortion (it added signal from the reverb tank send). You can rewire the switch to bypass the master volume. They are even heavier than a regular Twin Reverb (but nowhere near as heavy as my Super Twin Reverb 180 watts from 6-6L6s and monster spkrs). In either case get a hand truck or roller palette to save your back, trust me on this you don’t want a bad back. I hate when I have a block of idle time for playing ahead of me and I mangle my fingers. Too often. Hope it heals quick. Curious on the Nashville variant. I have a Steinberger Spirit that I wired the bridge pickup in the middle of the 5 way, which works pretty well for the odd complement I have in there (two Harmonic Design Z-90s and an old Dimarzio Strat single in the middle). Also glad to see you’re going old-school on the Deluxe. The octal stuff just isn’t thick enough on the ground. Last week I held my left hand up over my head into the ceiling fan at full speed ! Bruised badly everyone but my pinky finger , nice shades of purple and yellow ! Once I built a circuit with a bunch of CMOS DIP ICs in it. Turned it on and noticed a funny “things are getting hot” smell. So I (intelligently) used my index finger and pressed it down firmly on the surface of each chip in sequence to see which one it was. Soon, I realized that the time it takes your brain you register the fact that you’re burning the $#|+ out of your finger is actually too long to prevent serious damage. I came up with a very nice smooth rectangular area on my index finger, 0.25 x 0.8 inches, with the notch to show where pin 1 was. It blistered off, ultimately relieving me of about 1/16″ of my skin. My uncle, who is not a musician, but an inventor and craftsman, was working in his shop running a piece of wood though a jointer when he slipped and two of his fingers went into the blade. Somehow he had the presence of mind to find the fingertips among the sawdust and take it all down to the hospital. They sewed them back on with the aid of some skin from his thigh. After healing, those fingers always looked a little hairier than the others. 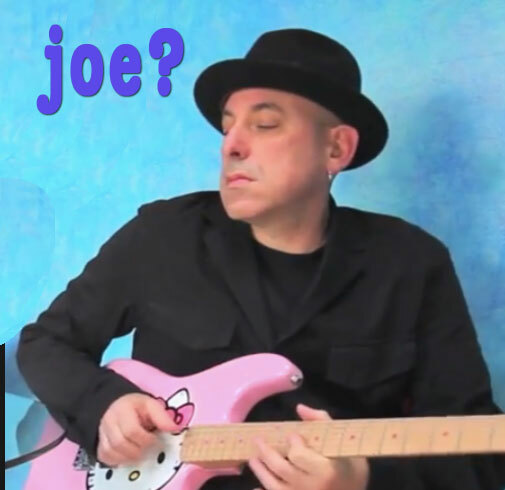 Joe it is time to get out a slide and work on sliding or spend some time with that lapsteel hiding under the bed. It may be that the guitar angels are sending you a message. What a bummer! Get well soon Joe. 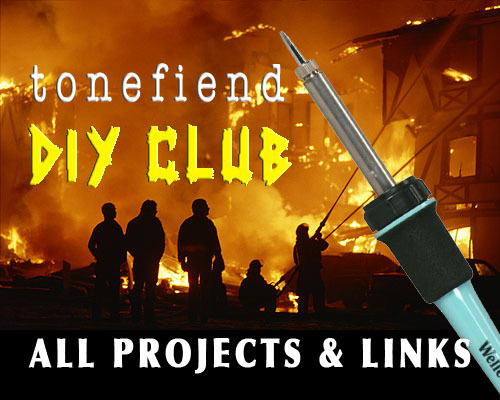 However, I’ve got a similar bad habit to the one that got you burned… that soldering iron tip is too tempting to use as a pick when you have some twisted wires impregnated with solder. My most frightening experience doing this? As soon as the wire pulled loose it flung a blob of molten solder towards my eye that I watched in a weird sort of panic-induced slow motion. Glasses are good.